SAN DIEGO – 3 Blind Mice Window Coverings, a San Diego based window covering company, recently announced the introduction of their first branded motorized shade to revolutionize a change in home automation. Starting Sept. 5, the Aloha Shade will be available as one of the most affordable motorized window treatments on the market, priced at $355 and can be installed in three weeks, a fast installation time compared to industry standards. The Aloha Shade will be available in three inch and four inch fascia as well as three inch Cassette Fabric Wrapped and three and a half inch Cassette Fabric Wrapped. Fascia and cassette colors are: white, black, bronze, almond, and anodized silver. Room darkening and solar patterns are also available with the Aloha Shade, ranging from one percent to 10 percent openness. “We wanted to create a shade that was reliable and low-maintenance with the motorized feature to integrate with home automation,” said Dietz. According Icontrol Networks’s State of the Smart Home report, 48 percent of survey respondents are excited about the potential convenience in programming home settings and maintenance. Additionally, 50 percent of consumers plan to purchase at least one smart home product within the next year. Seventy percent of survey respondents are excited about the potential savings they’d have on their energy bills from energy efficiency and monitoring. The Aloha shades come with a five channel remote, where 5 different programmable settings are available for monitoring. The remote can be programmed with other home automation products such as a smart thermostat or a home security system. Each motor comes with rechargeable batteries and has a permanent recharging cell. The charger can be used for multiple shades and a full charge is 700 cycles (up and down for 350 days). The Aloha Shades have a five year warranty and the motors have a one year warranty. For more information, contact us for updates on how to order and install the Aloha Shades. Our mission is to give homeowners pride and confidence in the window coverings they choose by delivering lifetime quality at an affordable price and industry-leading service before, during and after the sale. 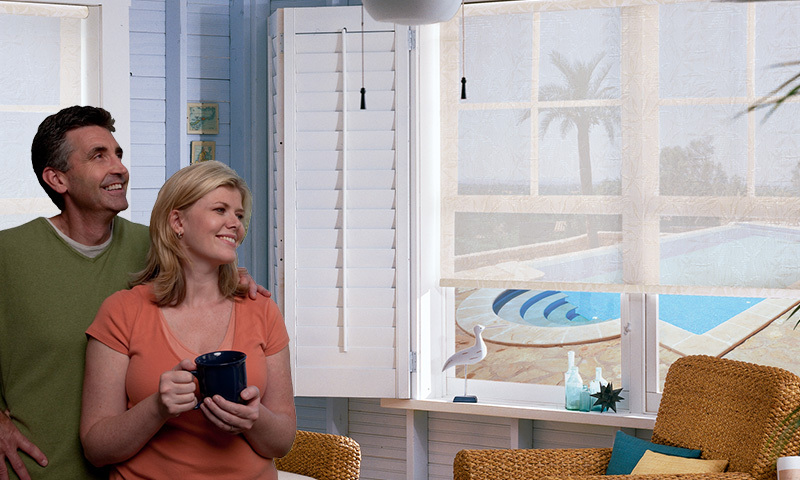 We serve San Diego, Orange County, Sacramento, CA with motorized shades, custom blinds, curtains, shutters and more.